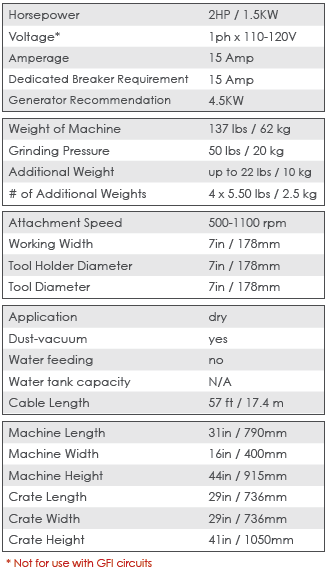 Lavina edgers are a must-have model for any concrete polishing arsenal. This edger is designed to grind and polish corners and edges with ease and work with Superabrasive's QuickChange tooling system. Lavina 7 inch edgers allow operators to grind and polish corners and edges with ease. The Lavina 7 is a 110V model, making it an ideal solution for residential projects. Lavina 7 comes with one 7 inch QuickChange plate and one 7 inch foam plate, ready for tooling attachment. They feature a flexible wheelbase for added maneuverability and are lightweight for easy transport. Click the button below to add the Lavina 7-X Floor Grinder/ Edger to your wish list.